Your survey should be as easy to complete as possible. Too many pages with questions that don’t relate to the participant can lead to more drop offs and incomplete results. 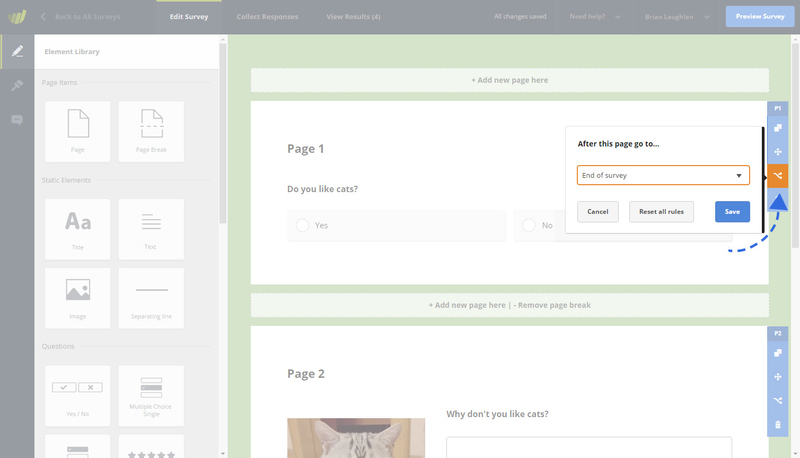 Skip Logic gives you the ability to skip certain pages based on what participants have answered. If somebody already answers that they like cats, then you can skip the page asking them why they do not like cats and go directly to the next page. To use Skip Logic you must have more than one page in your questionnaire. If you set rules on answers within a question then you can direct participants to pages based on what answer they select. We have many question types available but Skip Logic can only be used with “closed questions”. This is where only one single answer can be selected. Such questions are: Multiple Choice with Single Selection, Drop-Down List, Rating & Net Promoter Score (NPS). When the participant navigates next, instead of going to the next page, they will be taken to the page you have selected. In cases where there is a rule on the page and a rule on a question within that page, if there is a match with the question-rule, it will override the page’s rule. Rules on pages only apply if there is no matching rule in a question. If there are multiple questions with rules within a page, the last matching rule will be applied. 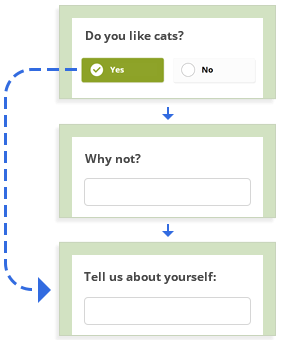 When you apply Skip Logic, you have multiple options to choose from in the drop-down, one of which is “End survey: Redirect to URL“. When this option is selected, you will be able to specify a URL. When the participant selects the answer you applied the rule to, they will be redirected to that URL. This makes for example participant screening extremely easy to implement and is also useful to you if you are using a panel provider to reach your participants, as they will more than likely provide you with links to use, such as “screen-out”, “quota full”, “complete”, etc. 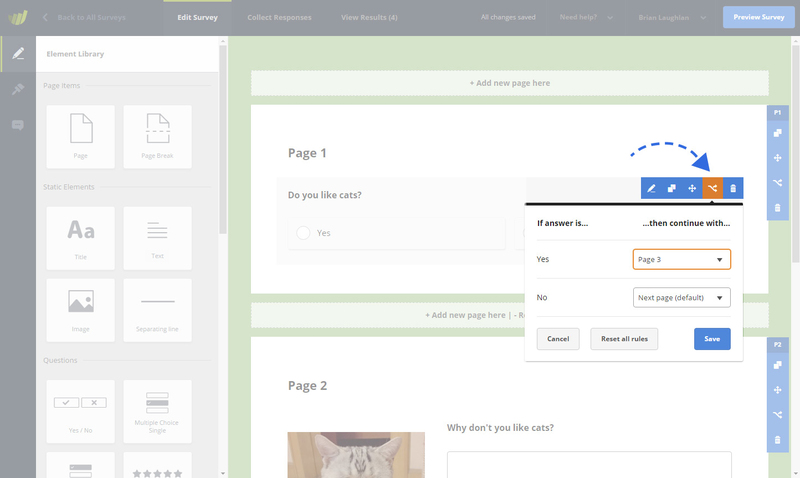 Skip Logic gives you the power to create complex surveys with minimal effort. The ability to skip pages and present relevant information to your participants is extremely useful and should improve overall response rates. You can also use URL variables within your redirect urls, just like you would use them in the questionnaire. Another way to hide irrelevant questions is to use “Display Logic“. Display Logic lets you show or hide elements dynamically and “live” – also within the same page. You can set that if someone answers “No”, it immediately shows a follow-up question “Why not?”, and so on. While Skip Logic lets you “jump” to a specific location within your survey (skipping pages), Display Logic lets you show or hide single elements and pages in real-time.